Is Bankruptcy Right for Me in Ohio? Let the Wood & Brewer of Westerville & Columbus, Ohio share a little insight on the matter. While there are many benefits to filing for Chapter 13 or Chapter 7 bankruptcy, it may not be the right choice for every consumer. At Wood & Brewer, LLC, our Columbus bankruptcy lawyers take the time to review every detail of your financial situation to determine whether or not bankruptcy is right for you. Discuss your case with a Westerville bankruptcy attorney. Call (614) 410-6878. You can trust the advice our attorneys give because we have handled all aspects of Chapter 13 and Chapter 7 bankruptcy for clients across Southern Ohio, Franklin County, Delaware County, and Fairfield County, including non-bankruptcy debt resolution solutions. We take a passionate and comprehensive approach to finding the best solution for each client without taking a formula or cookie-cutter approach. Every client is important to us, and we will work tirelessly to resolve every matter. No matter what debt you are facing, we are ready to serve you with the most knowledgeable advice in Ohio. With more than 15 combined years of practicing bankruptcy law, we are confident that we can find the most effective solution for any client. We will get through this together! 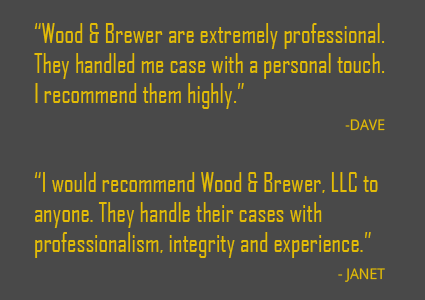 Wood & Brewer, LLC is on your side every step of the way, so don’t hesitate to reach out to our Columbus bankruptcy attorneys. We are available 24/7 to take your call.